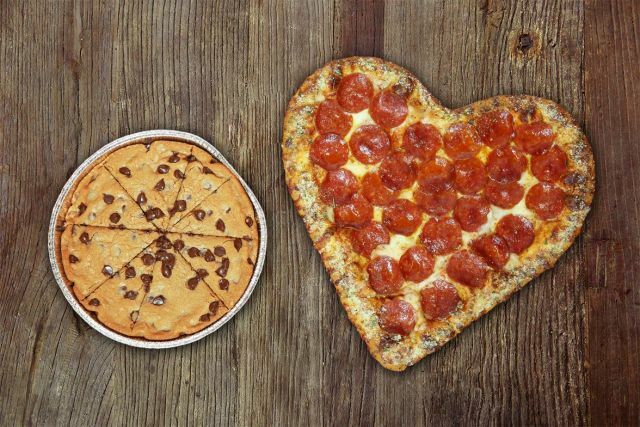 Pizza Hut's Heart-Shaped Pizza is once again available this year for the Valentine's Season at select locations. The pizza features the same toppings, drizzles, and crust seasonings as their regular hand-tossed crust but is shaped like a heart. The Heart-Shaped Pizza is being offered along with a choice of either a Hershey's Triple Chocolate Brownie or Ultimate Hershey's Chocolate Chip Cookie for $13.99 (may vary) through Valentine's Day. You'll actually want to call your local Pizza Hut to see if they're offering the pizza as it is not currently listed online.